December 6, 2017 By This post may contain affiliate links. Break open one of these festively decorated Minion Christmas Piñata Cookies to find banana candies hiding inside. 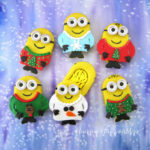 Each little Minion dressed in an ugly Christmas sweater looks as sweet as it tastes. Get ready to laugh as Gru, his wife Lucy, their cute daughters, Margo, Edith and Agnes, and the mischievous Minions come to life on your television screen. This year’s #1 animated movie, Despicable Me 3, is now available for home viewing. You can get the Blu-ray and DVD Special Edition at Target. This Target exclusive includes 20 minutes of bonus footage including a brand new mini movie all about Kyle, Gru’s oddly lovable dog. 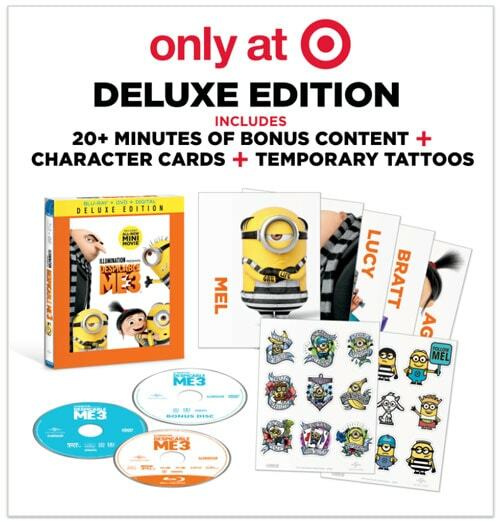 You’ll also get two sheets of temporary tattoos featuring the Minions and character cards. This will make a wonderful holiday gift for your family. Have you seen the movie trailer? There’s nothing like curling up together with some really fun snacks and watching a funny and heartwarming movie together, especially during the holidays. 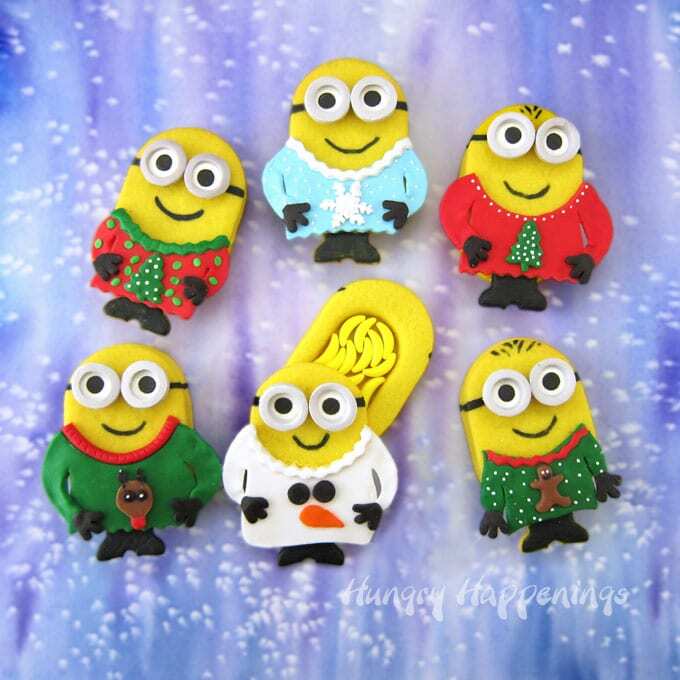 Speaking of snacks, how much would your family love munching on these candy filled Minion Christmas Piñata Cookies while watching Despicable Me 3? I shared my cookies with friends and have to say that as much fun as I had making these cookies it was nothing compared to the joy I felt watching my friends squeal with delight when they saw them. 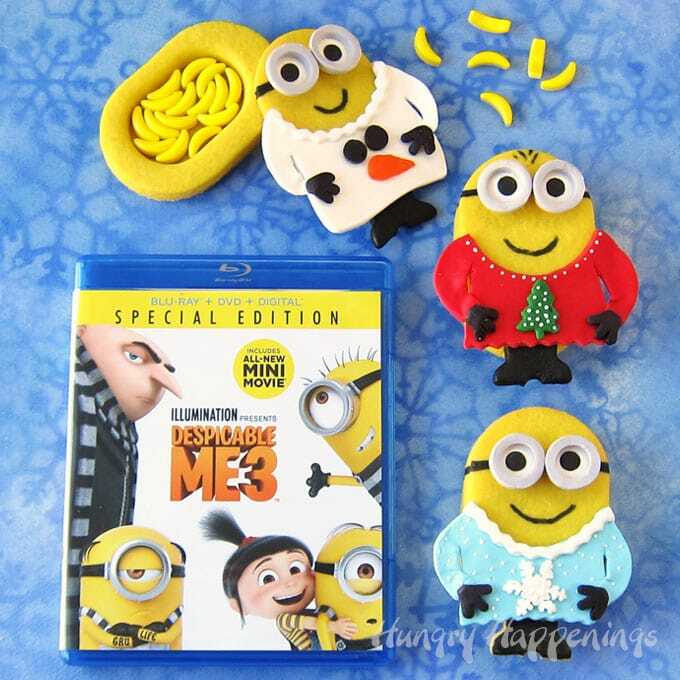 Each Minion is created using 3 different cookies stacked on top of each other and glued together using candy melts. The middle cookie has a hole cut out of it so there is room to hide the candies. The top cookie is decorated with an ugly Christmas sweater made out of modeling chocolate (candy clay). I couldn’t resist giving each Minion his own unique sweater. 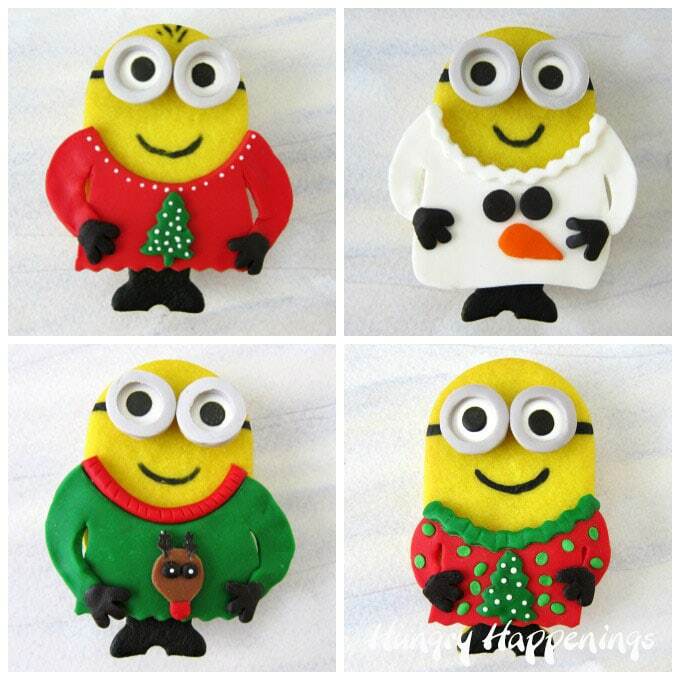 Break open a Minion Christmas Pinata Cookie to find banana candies hiding inside. 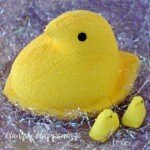 Add the egg, vanilla, and almond extract, and yellow food coloring and beat until well combined. You want this to be bright yellow. The color will tone down once the flour is added. Dust a silicone mat and non-stick rolling pin lightly with flour. Roll out some of the dough to between 1/4– 6/8 inch thickness. Create the middle cookies with a hole in the middle using a 2 1/2 inch and a 3 1/2 inch long oblong cutter. Press the 2 1/2 inch cutter into the dough. Remove the cutter and the oblong shaped dough. Center the larger oblong cutter around the hole, press down to cut the dough. Leave that dough in place and continue to cut until you have a total of 9 oblong cookies with holes in them. Remove the excess dough around each oblong then place the silicone mat in the freezer. Do not move these cookies until they are chilled. Once firm, carefully peel the cookies up from the silicone mat and place the cookies on a parchment lined baking sheet or simply bake them on the silicone mat. Roll the remaining dough out to about 1/8th inch thickness and cut out 18 more oblong shaped cookies. Roll the remaining dough out to 1/8th inch thickness and cut out 9 of the Minion’s legs and feet. 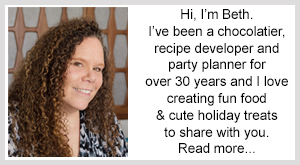 I used a bell shaped cutter, but a mini gingerbread or teddy bear cutter will work too. Use a tiny bit of water to attach the feet/legs to 9 of the oblong shaped cookies. Freeze all the cookies for 15 minutes until firm. Bake for 12 – 14 minutes until the bottom of the cookies just begin to brown. Remove and allow the cookies to cool completely. Use yellow candy melts to attach the middle cookie to the bottom cookie. Fill the middle cookie with candy. Roll out modeling chocolate, cut using a t-shirt or sweater cookie cutter, then decorate using more modeling chocolate and/or sprinkles. Attach the decorations to the sweaters using water or clear piping gel. Let the modeling chocolate sweaters dry until firm (15-30 minutes) then use yellow candy melts to attach them to the top cookies. Roll out gray modeling chocolate, cut using a large round plunger cutter, then cut out a hole in the center using a smaller round plunger cutter. 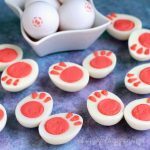 Attach the gray goggles to jumbo candy eyes using clear piping gel or make modeling chocolate eyes and attach them under the goggles. 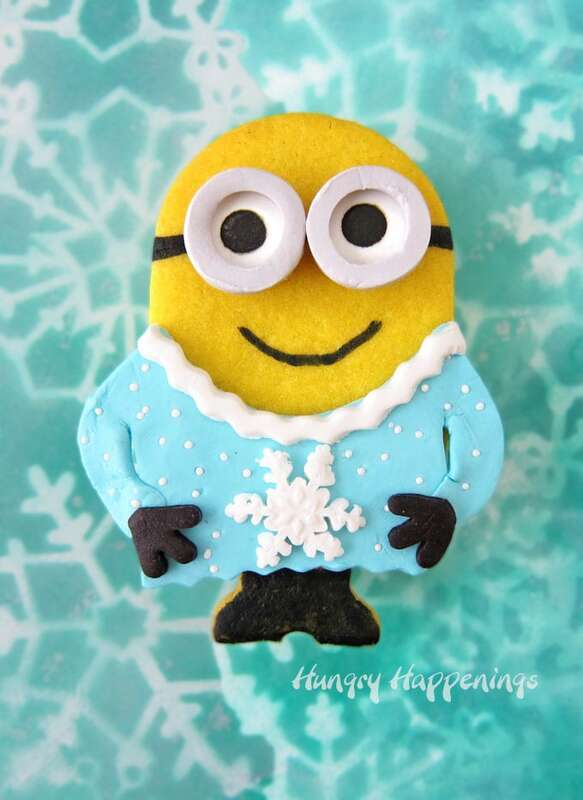 Glue the eyes and sweater to the top cookie using yellow candy melts. Attach the top cookie to the middle cookie using candy melts. Be sure that your middle cookie is at least ¼ inch thick so there’s room for your candy. I keep the top and bottom cookies thinner so that the entire dessert isn’t too much. These cookies are big enough to share! I recommend using modeling chocolate to decorate these Minion cookies because it tastes great, will firm up quickly and hold it’s shape nicely. You can use fondant, but you’ll need to allow the sweaters to dry for several hours so that the arms hold their shape. 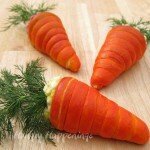 You can find the recipe to make modeling chocolate (candy clay) here along with detailed instructions for working with it. If you can find a sweater cutter that fits the wide Minion, use it! Mine was way too big so I opted for a t-shirt cutter. I had to flatten them out a bit to widen them to fit over the Minion’s bodies. I also cut some of the length off most of the sweaters. I cut gloves out of black modeling chocolate using a snowflake plunger cutter. 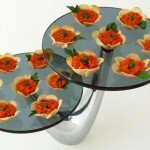 A daisy cutter would work well too. You just need to have 3 fingers on each hand. I used tiny metal and plastic plunger cutters to create the pieces for the gingerbread man, snowman, Rudolph, snowflake, and Christmas trees that adorn each sweater. I also added some sprinkles. Some of the sprinkles just stuck if I pressed them into the modeling chocolate while others needed a bit of clear piping gel to keep them in place. If you are excited to watch Despicable Me 3 at home be sure to stop by Target to get the Deluxe Edition. It’s only available at Target and you’ll definitely want all the bonuses! I loved watching the mini movie and bonus features in addition to the full length movie. There are so many things to love about this movie and if you didn’t get a chance to see it in the theaters, you must see it at home. You’ll laugh, and cheer and you may even cry. We enjoyed it the second time as much as the first and I’m sure we’ll watch it over again many more times. I was compensated and provided with a free copy of Despicable Me 3 Special Edition, but all the opinions expressed here are my own. I was excited to partner with Universal Pictures Home Entertainment to bring you these Minion Christmas Piñata Cookies. 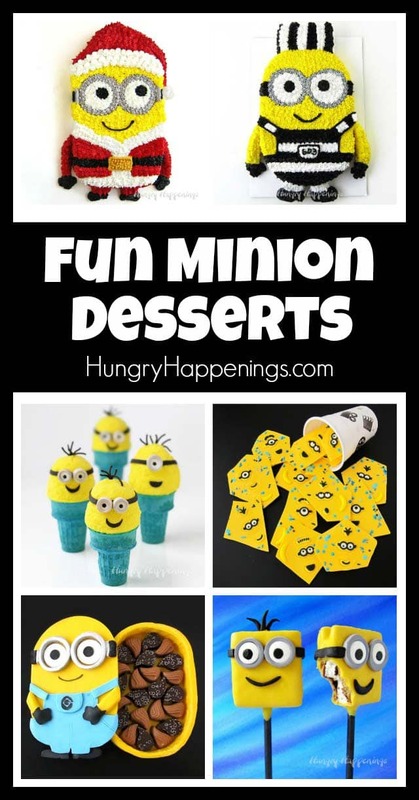 If you make these Minion cookies and share them online be sure to mention Hungry Happenings, link back to this original blog post and use the hashtag #hungryhappenings. Thanks so much, Karen! I had so much fun making the sweaters for these little guys. 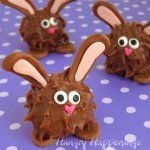 I can think of SOOOO many people who would love to receive one of these adorable cookies! Me too! 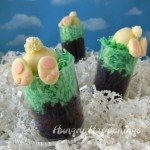 I shared them with friends and they love their special treats!